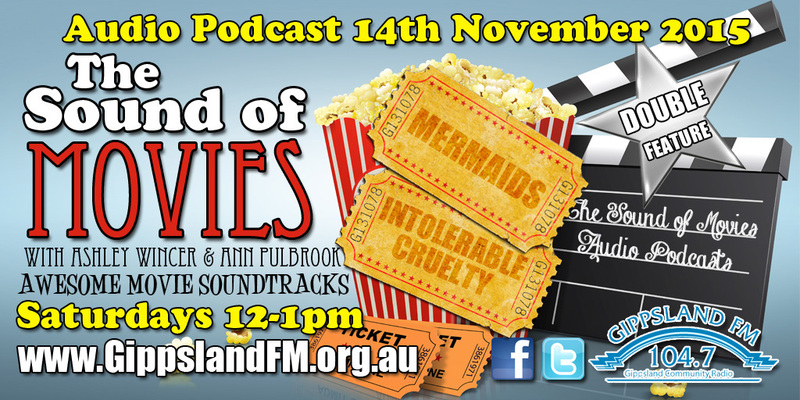 Podcasts The Sound of Movies weekly radio show, hosted by Ashley Wincer and Ann Pulbrook, aired on Gippsland FM every Saturday from 12pm til 1pm. The show originally ran for 2 hours from 2pm in September 2014 until the football season started at 2pm in April 2015. The new time slot was changed to 12pm for a 1 hour episode. All of the available podcasts are 1 hour episodes. Press the play button above to listen to the sample podcast. The entire collection of The Sound of Movies podcasts can be found on the official website or through iTunes. This selected podcast, The Sound of Movies Mermaids & Intolerable Cruelty episode is an example of the quality of the other 68 podcast episodes. The Sound of Movies radio show came to an end on January 28th 2017 due to full time studying commitments at RMIT.